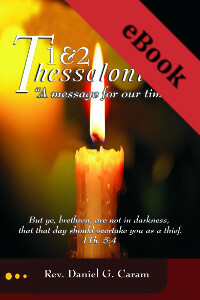 Epistles to the Thessalonians: A Message for Our Times is a complete verse-by-verse commentary on Paul’s epistle to the church at Thessalonica. Rev. Caram goes into detail about the struggles this church faced during the era of the Roman Empire, as well as the contrary messages about the Second Coming of Christ that were circulating through the churches. This book will offer practical advice as to how we can be prepared to meet the Lord when He comes again.